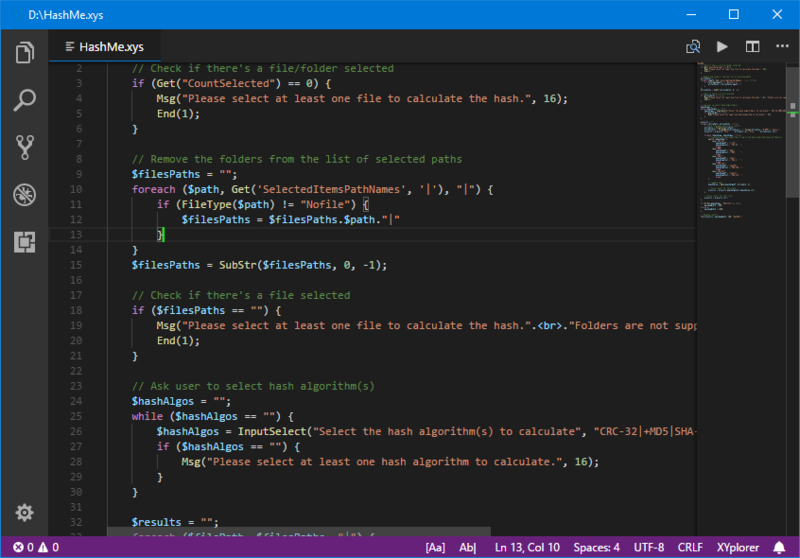 Visual Studio Code>Programming Languages>XYplorerNew to Visual Studio Code? Get it now. Install and open Visual Studio Code. Press Ctrl+Shift+X or Cmd+Shift+X to open the Extensions pane. Look for "XYplorer" and install the extension. You can also install the extension from the Marketplace. Open any .xys or .xyi file in VS Code. The extension is now activated. If you have a bug to report, or simply an idea for an improvement or a new feature, please add them in the issue tracker. The .tmLanguague file is based on https://github.com/Binocular222/XYplorer/blob/master/XYplorer.tmLanguage. vscode-xyplorer is licensed under the MIT license.